Skye is a three year old Australian Shepherd. "Skye is my husband's heart. 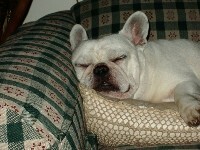 She is a good natured ball dog and is highly intelligent." Check out Skye on her website. Bonzer is a 2 year old Australian Shepherd. "Bonzer was left tied to a tree in Texas to die. I had him transported here, and he is learning the house rules and training us!" Check out Bonzer on his website. 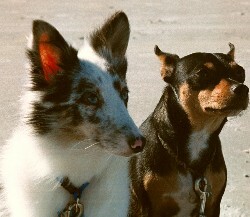 Their mom also writes: "As part of my Aussie rescue efforts, I try to show people not to be afraid of deaf dogs. Most people are quite surprised to learn how well they can function." Human companions: Annette M. Jaeger and her husband John. 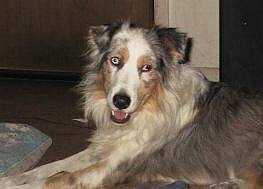 Other pets: Wallie, an Aussie X; Maverick, a black tri Aussie; Merry, a red merle Aussie is now 2 years old and has successfully had cataract surgery! Human companions: Sherrie King, her husband and three children. 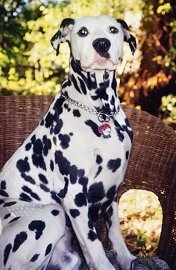 Deaf dog: Fred is a 6 year old Dalmatian. Fred was rescued in Brooklyn and loves chasing balls at the dog park. 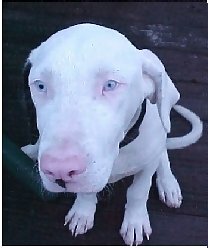 Deaf dog: Max is a 13 week old American Pit Bull. "My dog Max is a solid white pit. He is beautiful. 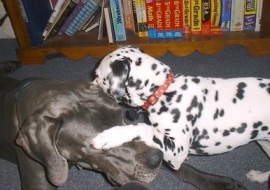 We purchased him from a friend whose litter was 13 pups, turns out 4 were born deaf." Human companions: Judy Wilkinson, her boyfriend, Johnny Strickland, sons Brian Wilkinson and Nick Lacaze. Deaf dog: Powder was given to me by my boss who knew I had a soft spot for animals. He was supposed to be destroyed by the breeder, but we've got other plans for him. He is beautiful and learning to love & trust people. We hope we have many years (& memories) to come with him. Other pets: Rone joins another Border Collie Kelsey, also a rescue, two Aussies, a 13 year old Bassett and a 10 year old lab. Deaf dog: Buddy's human pal writes: "Buddy Boy was such a wonderful companion and became best friends with my cat, Spunky. 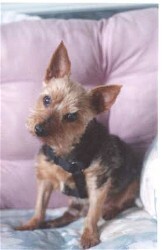 He lost his ability to hear and also became partically blind when he was about 10. However, it did not stop him from enjoying life to the fullest. 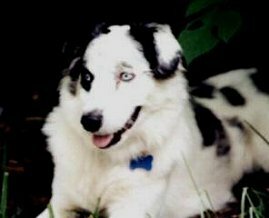 Unfortunately, he passed away on August 23, 2003 due to kidney complications"
Deaf dog: Powder's human companion writes: " Powder is solid white and very energetic. He shares his home with 2 other female pit bulls that are also solid white but they can hear"
Deaf dog: Delilah is a double merle sheltie who is 11 months old. Her human pal writes: "Delilah hails from St. Louis, Missouri. I fell in love with her when I saw her on deafdogs.org. I have been using the clicker training method. Right now she and Skyler (her hearing brother) knows friends, sit, down, wait, stay, and high five - most of the commands are in ASL. She is a real beauty. If you look into her eyes, it is almost as if it was perrywinkle blue."